A reach is defined here as a pick well above the rated position of the player. These are some of the worst reaches. Jets Dexter McDougle CB Maryland – They spent the 80th pick on a guy that was a 7th round value even when healthy. Bucs Kevin Pamphile OT Purdue – He struggled all season but the Bucs took him with the 149th pick. I had him ranked in the 790s. Seahawks Jimmy Staten DT Middle Tennessee – Staten was ranked in the 790s but despite a good draft the Hawks took him at 172. 49ers Kenneth Acker CB Southern Methodist – The Niners had a good draft but this one is a head scratcher. Acker was rated in the 550s but they took him with pick 180. Rams Maurice Alexander SS Utah State – The Rams did well over all but took Alexander with pick 110 despite most analysts thinking he was undraftable. I had him in the 450s. Jags Brandon Linder OG Miami (Fla.) – Linder was a 7th round value but the Jags took him with pick 93. Redskins Spencer Long OG Nebraska – The Skins had only a few picks but wasted on on Long who was a 7th round value at best but was taken with pick 78. Falcons Dezmen Southward SS Wisconsin – He was a late 6th round value but they took him with the 68th pick. Giants Jay Bromley DT Syracuse – Bromley was a 6th round value but the G Men took him with pick 74. Raiders Derek Carr QB Fresno State – OK I am one of a few analysts that really didn’t like Carr. At best he is Brandon Weeden lite. The Raiders took him with the 36th pick. I had him ranked as the 254th best QB but only 17 QB prospects were considered draftable. That is what I think. Tell us what you think. NOTE: Check out the live News, Notes and Rumors show on Monday, Thursday and Friday at 6 PM Eastern on or https://fryingpansports.com/radio-show/. 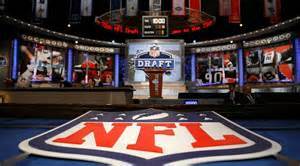 On Samantha Bunten of NBC Sports, former NFL scout Kelron Sykes and I talk NFL draft with just a little Indians and Cavs thrown in. The archive is available on https://fryingpansports.com/radio-show/. Please join us. Bill Smith is a former coach of several semi-pro teams, has officiated both football and basketball, done color on radio for college football and basketball and has scouted talent. He edits https://fryingpansports.com. He has also published several novels on and a non-fiction work at http://www.merriam-press.com/. Follow him on twitter @NNRonDSN to get the schedule of Special News, Notes and Rumors broadcasts. You can hear the previous shows on https://fryingpansports.com/radio-show/ and the live show Mondays at 6 PM Eastern time on .